The mid-size segment of the auto world has never been short on competition, but these days it seems like the 2015 Honda Accord is taking down challengers left and right. This spacious family-friendly car has room for up to five, a wide range of high-tech safety features, an interior that is loaded with features, and a pair of powerful yet fuel efficient engine options. 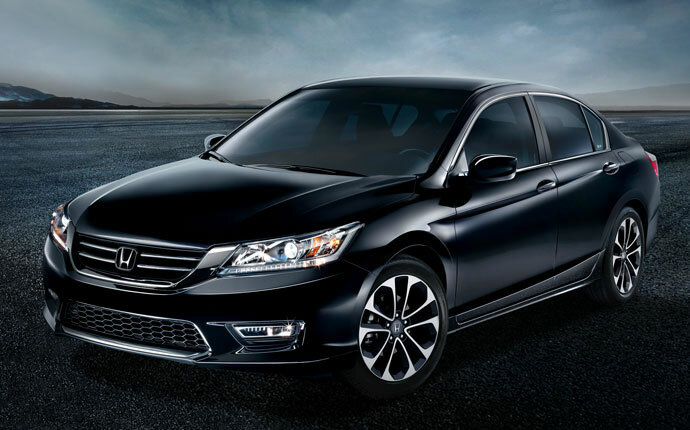 And the Accord does it all at one of the most affordable prices in its class. By giving drivers two different engine options to choose from, Honda has made the Accord more appealing than the typical mid-size sedan, and whether you choose the standard 4-cylinder or the available V6, you’ll still have one of the world’s most efficient cars on the road. Technologies like variable cylinder management and the Accord’s multiple state-of-the-art transmission options ensure that this Honda gets the most out of every drop of fuel. 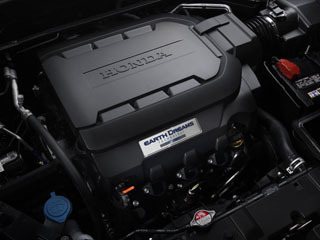 Honda’s 3.5L V6 engine comes standard on the top-of-the-line Touring trim and can be added onto the Accord EX-L for drivers seeking a more powerful engine under the hood of the Accord. Capable of 278 hp and 252 lb-ft of torque, the 2015 Accord models with the V6 engine earn an EPA-estimated 34 highway mpg and 21 city mpg. How does the 3.5L V6 keep such a high fuel economy while delivering so much power? 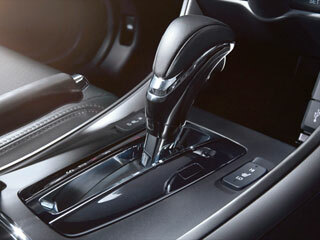 The six-speed automatic transmission is one part of the solution, delivering smooth shifting, swift acceleration, and one of the broadest torque curves of any automatic transmission. That sixth gear gives the Accord the ability to kick it up a notch when you’re in a hurry, too. 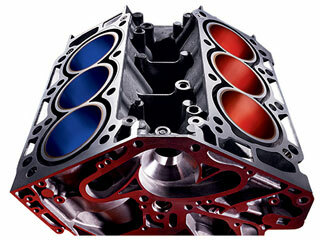 Do you know why V6 engines used to guzzle gas? It’s because they would use all of their cylinders all of the time. The Accord’s V6 engine is capable of shutting down two or three of its cylinders while coasting to conserve fuel; why waste it when you don’t need it? If you want to improve the performance of a car, your first step should be the suspension. 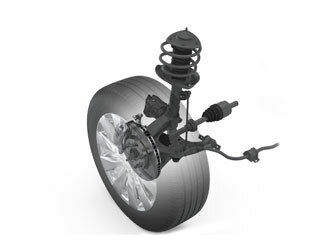 The rebound spring of the MacPherson suspension is designed to keep your sedan connected to the road for improved stability and easier cornering, while its compact build helps decrease road noise and vibrations. 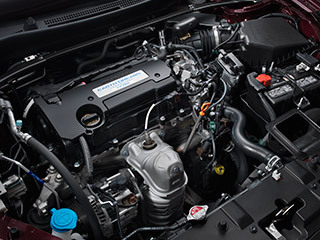 New electronics sync the car’s accelerator with a valve in the intake manifold, so that the Accord’s engine response is optimized for the current conditions. The Accord’s drive-by-wire throttle is designed to deliver consistent power and performance, resulting in behavior you can depend on whenever you’re behind the wheel. 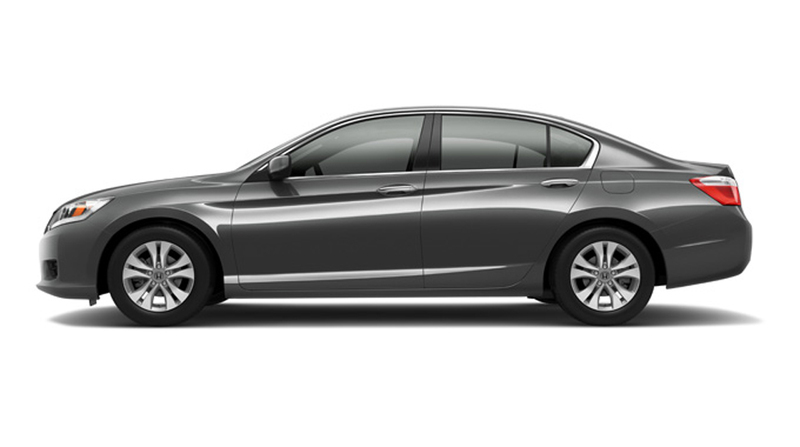 Honda has a reputation for safety, and that goes double for mid-size cars like the Accord. High-tech standard safety features help ensure that Honda’s vehicles are all smart choices for families, and available upgrade options like a multi-angle rearview camera and a forward collision warning system can give you the latest in accident prevention technology. 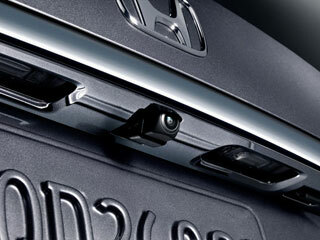 The standard rearview camera on the Accord gives you an unobstructed view of what’s behind the Accord with a set of guidelines to make backing up even easier. Upgraded trim levels come with a multi-angle rearview camera to provide three views for added peace of mind before backing up. 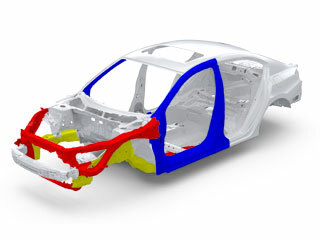 The Advanced Compatibility Engineering body structure not only serves as the Accord’s skeleton, it protects you and your passengers in the event of an accident by redirecting crash energy to other vehicles in the collision and crumpling in all the right places to minimize the risk of injury. 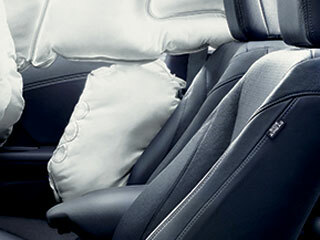 The Accord is literally built for safety from the frame up. Before anti-lock brakes, you would need to pump your brakes during hard braking to keep your wheels from locking up, but the Accord does the brake pumping for you. Four-wheel disc brakes with electronic brake distribution are standard on the Accord, ensuring you can come to a complete stop regardless of the road conditions. 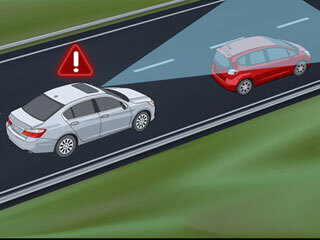 We have reached the point where cars can actively help us avoid accidents; the Accord’s available forward collision warning system uses either a camera (EX-L) or a radar system (Touring) to judge how far away you are from another vehicle. If it senses that you’re getting too close to another car and could collide with it, the system gives you audio and/or visual alerts. Airbags are a standard piece of auto safety equipment, but Honda has been making advances to help improve their effectiveness and reduce the risk of injury. Multi-stage dual-threshold front airbags are designed to deploy with the right amount of force based on the size and weight of the front occupants. 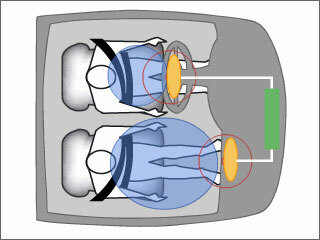 Side curtain airbags are set to deploy in a rollover, and SmartVent front side airbags deploy immediately and vent quickly to cushion with just the right force. Improperly inflated tires can lead to poor vehicle performance or even a tire blowout if the sidewall gets too damaged. 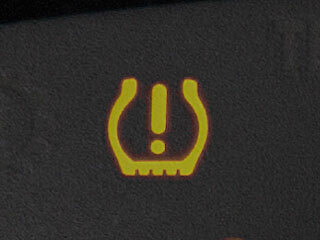 Low tire pressure can also lead to reduced fuel economy. The Accord’s tire pressure monitoring system alerts you if any tires are under-inflated with a flashing light in the dash. Though the 2015 Accord is a mid-size vehicle, it has all the space of a full-size car on the inside, offering up to 103.2 cubic feet of passenger space and seating for up to five. With plenty of room to get comfortable in the Accord, you may want to stay in there for a while, and Honda has equipped the vehicle with enough standard and available technology features that you may not ever want to leave. And if you need a breath of fresh air, the available one-touch power moonroof should do the trick. 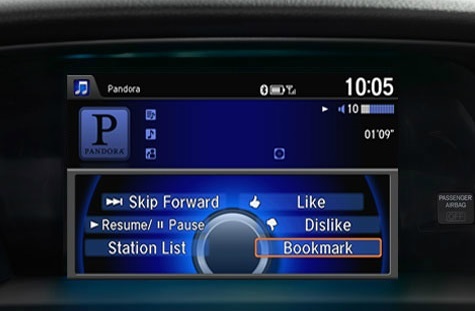 Honda’s available telematics system is powered by Aha, and delivers you social media, music, news, audiobooks, and more, through the cloud-based service. It even knows you so well that it can provide personalized restaurant recommendations. Using your HondaLink system is just as easy as managing the apps on your smartphone. Honda’s intelligent Multi-Information Display comes standard on every Accord and is paired with an eight-inch touchscreen interface to give you easy access to your music, smartphone features, and car settings on a crystal clear customizable screen. Fit the i-MID with your favorite wallpaper to add an extra personal touch to the Accord’s interior. 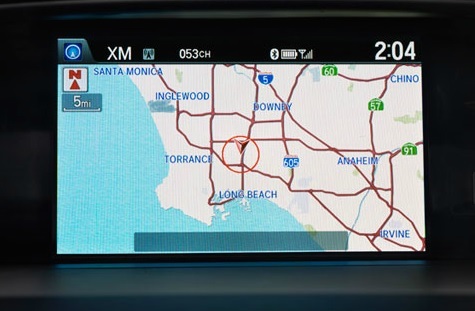 The available satellite-linked navigation system does more than get you where you’re going; it is able to respond to traffic jams and accidents in order to route you along the fastest path to your destination. 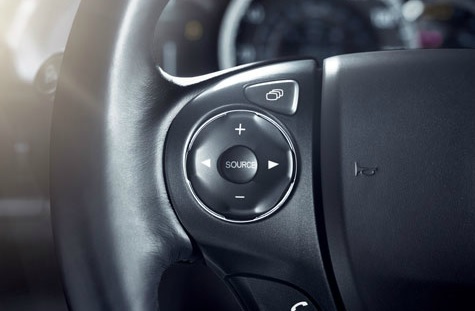 As an added bonus, it features voice controls that let you tell it where you need to go while keeping both hands on the wheel. While Honda has engineered the Accord’s interior to be incredibly comfortable, sometimes you just need to let in a bit of fresh air. 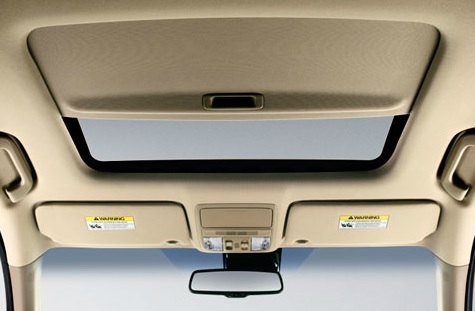 The available one-touch power moonroof lets in air and sunshine with just the push of a button and features a retractable sunshade if you just want to let in a cool breeze. 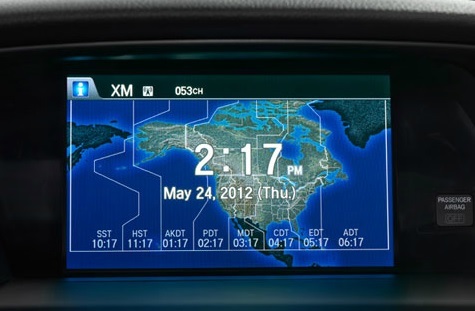 Even if you don’t have the navigation system, you can manage many of your infotainment features without ever taking your hands off of the wheel. Make phone calls, adjust your cruise control, skip to your favorite song on a playlist, or turn the volume down with Honda’s steering wheel-mounted controls. 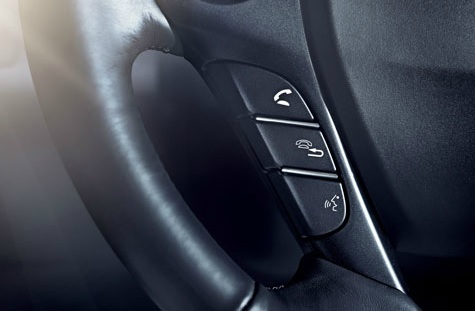 If you have a Bluetooth compatible smartphone, you can connect it to the 2015 Accord to make handsfree phone calls or stream music wirelessly. Once you sync your phone up with the Accord once, it will connect automatically for one of the most seamless technology experiences available in the auto world. The unique style of the Accord combined with its wide range of color options and exterior accessories practically guarantee that your new car will make a good impression on any who see it. The Accord’s alloy wheel options, spoiler choices, and bold front grille all combine to put it in competition with cars both larger and more expensive. Both the 2015 Accord Sedan and Coupe are reshaping what drivers think of mid-size cars. 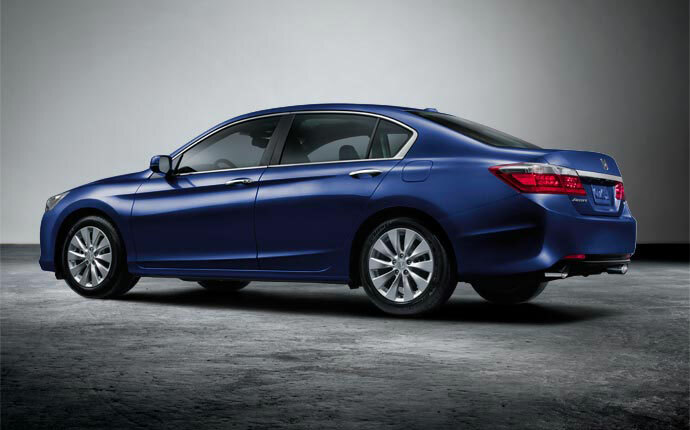 While competitors often settle for boring sedans, the Accord is bold, with a design that is evocative of luxury sedans. The available decklid spoiler adds a bit more flair while still keeping the Accord respectable. The Accord Sedan is available in eight different colors, while the Coupe changes things up a bit featuring four of the same colors and three more vibrant colors befitting its sporty nature. Whether you want a subtle and subdued sedan or a coupe that looks just as fast as it is, the Accord has you covered. 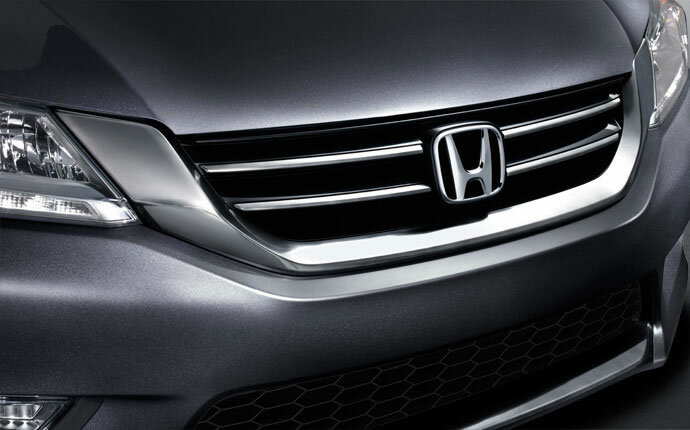 More than just a way to send the necessary air into your engine, the Accord’s grille gives it a bold front end that drivers are sure to remember. The grille adds yet another level of sophistication to the Accord, putting its looks into direct competition with luxury sedans—without the luxury pricing. 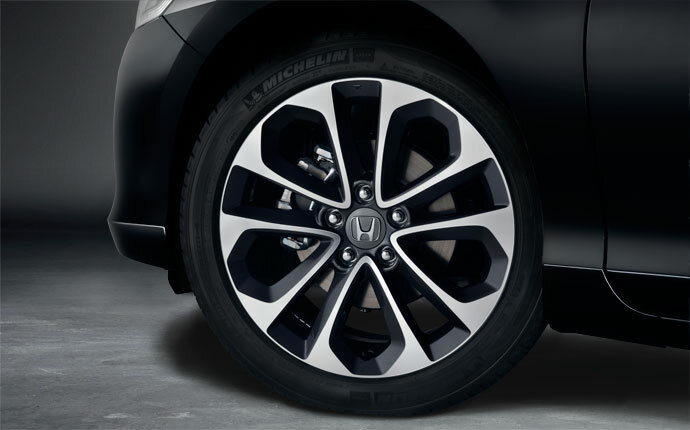 Standard on every Accord, alloy wheels are about more than just good looks; they are lightweight and built for durability too. Of course, the fact that Honda has a variety of alloys depending on the trim level is proof enough that they do add another level of style to the car. 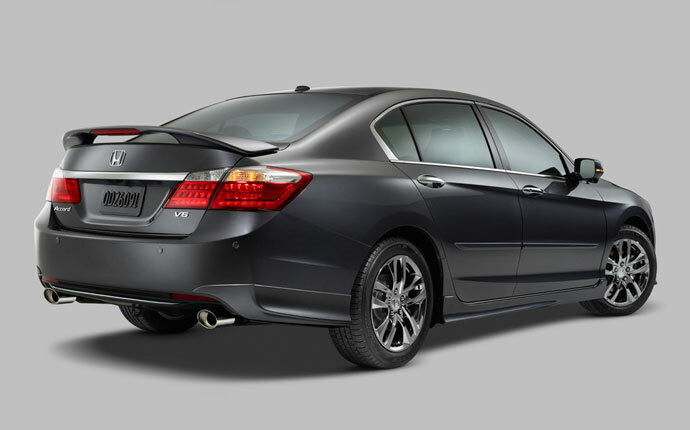 With both a rear decklid spoiler and a rear wing spoiler available, drivers who want that extra sporty look and feel on their Accord need only add on an accessory. The rear wing spoiler makes a bit more of a statement than the decklid, but they both increase downforce and improve the aerodynamics of the Accord. The Accord already has a bold, sculpted design, but if you want to keep your doors free of dings and add a little extra something to your Accord, body side molding is the smart option. 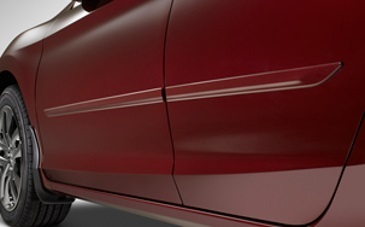 These side moldings are matched exactly to the color of your Accord and are custom fit, as if they were installed at the factory.